Riverview Systems Group Shines at AAOS 2017 with Zimmer Biomet | Riverview Systems Group, Inc. Team Blue was once again back at the annual American Academy of Orthopaedic Surgeons (AAOS Members) meeting in San Diego, providing creative/tech support for our long-time client Zimmer Biomet. The show — the most important industry event attended by orthopedic surgeons and allied health professionals — was held March 14 through March 18, and marks our 19th year at the AAOS as a direct vendor to Zimmer (as of 2016, Zimmer Biomet), working with the company’s Convention Services division. The overall Zimmer Biomet exhibitor show footprint booth this year was over 29,400 sq. feet, featuring a 2nd floor with an additional 5,500 square feet, housing a dozen private conference rooms. The load-in alone took nearly 10 days with a crew of 20 RSG team members and an additional 60 locals to bring it all together. 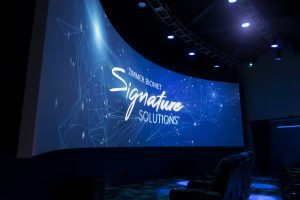 Williams explained that due to Zimmer Biomet’s new ‘Signature Solutions’ initiative, which became the thematic focus for 2017, an immersive theater experience was suggested by the Event Marketing Group at Zimmer Biomet. Working with other key creative partners Stage Rigging, Inc., Catalyst Exhibits, Inc., TRU Service Group, and Varipix, Riverview helped facilitate an immersive theater, featuring an ultra high-res video presentation on a 40’ blended wide cinema screen set in a private theater within the booth space with 4K resolution. “It ended up being the only blended widescreen, that I know of, ever presented on a trade show floor at a double-wide 4K resolution,” Williams noted. 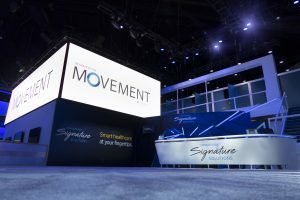 Another focal point this year was a 10’ x 55’ wide LED “Billboard” centered in the booth space allowing for overall branding, schedules of Zimmer Biomet events outside the booth and testimonials to significant surgical luminaries who had recently passed. Equally impressive was the booth’s interactive and virtual components. From an interactive standpoint, Riverview designed and implemented a custom digital audio matrix system that gave tour guides and vignette presenters control over where their microphones were fed, in specific areas, for multiple small-group tours running simultaneously. The virtual booth experience had much to do with new mobile apps, for both iOS and Android platforms that were shown to attendees via tablets, as well as VR goggles and headphones. The Zimmer Biomet apps provided information about the future of interactive physical therapies that patients can interact with at home, as well as seamless transmittal of results to health care providers, etc. Riverview was tasked with the technical set-up of the various demonstration areas, including large touch screens that mirrored the VR experience. For a look at the massive technology firepower required for a show of this magnitude, check out the gear list below! Total Rig Weight approx. 105000 lbs.